It’s already been quite a summer. Wimbledon and the World Cup have produced some of the most compelling sports viewing in recent memory. Combine this with the heatwave and ‘hottest day’ Met Office alerts, and you’ve got a cocktail that is proving a strong draw for us in the APHA laboratories to want to seek a cool drink. It seems like a cruel joke then that the national carbon dioxide shortage is threatening both laboratories and carbonated drinks alike. Save your sympathies however for the UK’s wildlife. It may be hard to imagine after the scorching recent weeks, but it wasn’t always this hot. In fact as recently as March 2018 some parts of UK experienced sub-zero temperatures and snow cover over many days. This extended winter weather had deadly consequences for wildlife with deer, wild birds, frogs and newts all suffering from the extreme cold. Scientists from APHA’s Veterinary Investigation Centres (Surveillance and Laboratory Services Division) Paul Duff, Sian Mitchell and Colin Weaver have recently published an article on these mass mortality events in the Veterinary Record. The article, written in collaboration with Becki Lawson of Garden Wildlife Health, details the unfortunate extent of the prolonged winter period. Red deer were found dead on the Cumbrian fells after snow drifts melted with no evidence of infectious disease. The deer had full stomachs, but were in poor body condition due to parasites, which ultimately contributed to them succumbing to the very low temperatures. 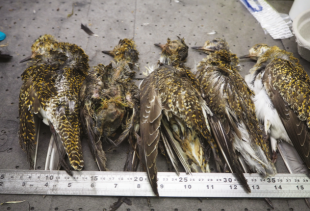 Submissions of dead wild birds such as oystercatchers, golden plovers and lapwings were also received by the APHA Diseases of Wildlife Scheme. These ‘waders’ were in an emaciated condition and it is likely that they arrived in their upland breeding grounds only to find the frozen conditions preventing them from feeding. Waders rely on their long beaks and even longer legs to stand in water and mud to feed on invertebrates along the shorelines of lakes, rivers and the coast. Heartbreakingly, or rather beak-breakingly, the wading birds found they couldn't probe with their beaks the frozen ground to feed and died of starvation. The low temperatures also affected amphibians such as common frogs and smooth newts as they emerged from the refuge of over-wintering sites. These are being dubbed ‘winterkill’ events. Amphibian winterkill events were reported at twenty-two sites across the country which were attributed to ice remaining on ponds for longer than usual. Whilst the article in Veterinary Record made for grim reading, it does highlight the good work performed by the APHA Diseases of Wildlife Scheme which is celebrating its twentieth anniversary this year. The scheme is part of the APHA Surveillance Intelligence Unit, led by Richard Irvine. The original brief back in 1998 was to deliver wildlife disease surveillance across England and Wales to government. In simplistic terms this means examining unusual and mass mortalities of wildlife at post-mortem to find what the cause of death is, and being particularly on the look-out for new diseases. Following wide consultation, the government produced a strategy document - The England Wildlife Health Strategy. The strategy tackles the issues and challenges surrounding wildlife health by defining the important areas such as threat assessment, policy prioritisation and mitigation measures, and making it clear whose responsibility it is to work in these areas. As part of this, APHA now chairs the Great Britain Wildlife Disease Surveillance Partnership, a partnership of government and non-government agencies, each with their own specialist wildlife areas. This provides a deeper and more extensive national wildlife disease surveillance, which includes Scotland. Quarterly GB Wildlife Diseases Emerging Threats reports are compiled. They summarise investigations into threats and other surveillance issues to inform governments, the veterinary profession and livestock farming industries of new or re-emerging threats. If you have experienced any wildlife mortalities due to the long winter, or due to the hot summer for that matter, we’d be interested to hear your stories in the comments box below.